Designed to fit over standard vinyl fence & 2×6 wood rail fencing. The patented Easy Snap Insulator is made from a durable, non-conductive and “poly” plastic that is designed to withstand not only the extreme elements of weather, but the physical support challenges required of electric wire and tape fencing. 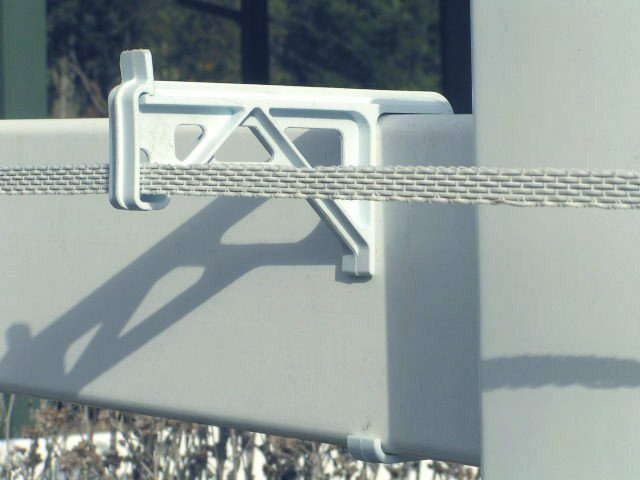 Engineered with computer aided design software, the structural and strength integrity of the product was designed to exceed the required specs for electrical wire and tape fencing. The locking mechanism for the electrical wire or tape is strong, yet easy to open and close. As you can see from the design, the Easy Snap Insulator does not have sharp edges or pointed areas that could potentially injure a horse or animal. Even the plastic itself will not shatter, but is designed to maintain its structural integrity under extreme duress, while remaining flexible. Because of its versatility and ease of use as a vinyl or wood rail electrical fence insulator, it allows you to adjust to the varying needs of each type of animal that you raise. Horses, cattle, sheep, or llama’s, each come with their varying bad habits and needs. The Easy Snap Insulator is designed to help you expand the use and effectiveness of your vinyl or wood rail fencing. The Easy Snap Insulator is made specifically for clients who use standard vinyl or 2×6 wood rail fencing. Although the Easy Snap Insulator provides a little room for less than standard fencing sizes, if your fencing falls outside of the below standard rail sized dimensions, then this is not the product for you. 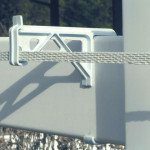 If your vinyl fence provider utilized a slightly different specification, or you are unsure of your specifications, we suggest starting with a sample pack order which will allow you to test the viability of the brackets on your unique fencing. Once you have verified that it will work for you, then place your full order. Your satisfaction is very important to us. Designed to fit over standard vinyl fence and 2×6 wood rail fencing with outside dimensions of 1.5 x 5.5 inches.